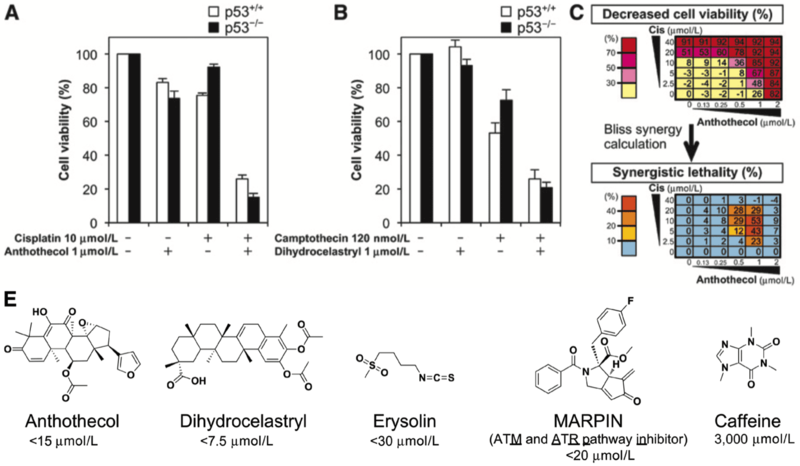 Novel ATR pathway inhibitors (anthothecol, dihydrocelastryl, erysolin, and MARPIN) sensitize p53-deficient cells to DNA damage. A high-content imaging screen was performed for discovery of ATR pathway inhibitors. Novel ATR pathway inhibitors do not directly suppress ATR catalytic activity. Novel ATR pathway inhibitors sensitize p53-deficient cells to DNA-damaging agents in vitro. A novel ATR pathway inhibitor synergizes with cisplatin to suppress p53-deficient tumor growth in vivo.